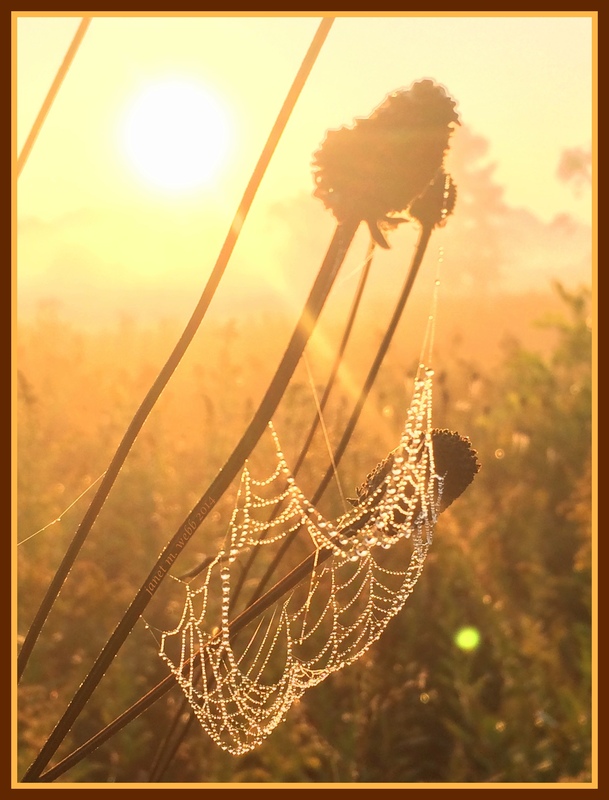 “Dreamy” is a morning walk in my park, just as the sun comes up and the dew hangs heavy on the spider webs. The air is cool and the possibilities limitless. it looks like diamonds, that’s beautiful! Reminds me of a diamond necklace. I keep taking photos of spider webs with dew because they’re so beautiful. It looks possible, doesn’t it? The mornings were beautiful and if I got there at the right time, there were so many webs like this. Thanks, Julie. Have a wonderful weekend. Gorgeous…and dreamy. I agree with easyweimaraner — it does look like jewels, from nature. Thanks so much, Lola. I was so pleased to see how this one turned out. Nature’s jewels are the most beautiful. Thanks so much for that lovely comment. What is the secret, Janet? I have never been able to capture a web with my phone. Must I buy a real camera to achieve this? Never mind me, your photo is just dreamily beautiful! This was taken with my iPhone 5s. I think much of it is capturing the light just right. Then, having water drops helps and finally, you have to keep tapping to get the focus right. :-). Keep at it. It will work and be great when it does. Thanks, Janet. I am encouraged to know this was taken with a phone. I will keep trying then. Thanks! Sometimes trying to get the phone to focus on what you want is so frustrating and getting the light right can also be a challenge. But the ease of carrying the phone (mostly) makes up for it! Very beautiful like string of pearls. It does look like that, Indira. Thanks. What a magical photo! I love the spider web! It was a morning sight that brought joy to my heart. Thanks! When I got home and saw it, I loved it, too. The web dream catcher. Outstanding photo with pearly beads of dew. For many mornings there was this sort of beauty. It was a wonderful way to start the day. I love the effect added by the flare! Anita, the sun was just in the right place to give the cool light effect. That whole morning walk was magical. Cathy, I’m very happy you enjoyed the photo. W.O.W. – Wondrous Overwhelming Wealth of nature and photographer’s eye. Ah, Marion. Thank you so much. I did look for hay bales and sunflowers, bu there aren’t too many of each here right now. Lots of beauty, however. Leay, wouldn’t it be wonderful to have such a beautiful necklace? It would – but it’s only in my dreams! Hmmm, Leay, not Leay. Sigh. Dreamy indeed- That is one unbelievable capture. I’m just speechless at that beauty. Gorgeous light, I love it! Thanks so much, Jeff. Since I admire your work, that means a lot. As soon as I saw this shot I thought of fairy tales – because I knew a handsome prince had just passed by on his horse en route to the beautiful princess in her castle aka dreamy. Loved the lighting in the photo as well as the beauty of the web (complete with water diamante droplets). Pure niceness and job well done. Thanks very much. I just kept taking more and more photos as the morning was so lovely. So precious, I love it! I’m glad. Thanks for visiting and commenting. I’ve seen a lot of the cobwebs in the morning dew shots, but this one was really groovy. Love the angle, and that the drooping nature of it was perfectly captured. Another thanks, Matt. I spent a lot of time capturing the webs with the dew on them and having the sun in the background was an enormous bonus. It was an exciting morning of photography and walking.